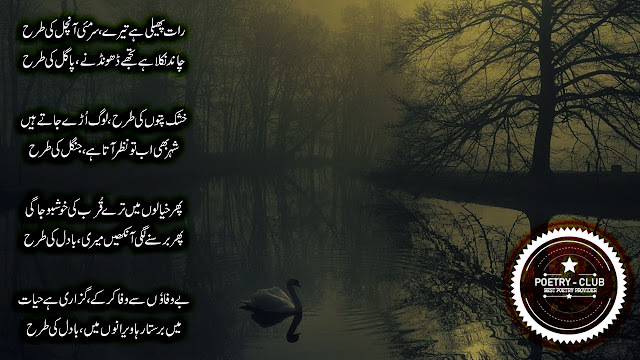 POETRY CLUB Ghazal Shayeri Image Poetry Urdu Ghazals Urdu Poems Urdu Poetry Surmai Aanchal ki Trha ...! Surmai Aanchal ki Trha ...! Poetry is only the language which describe your whole feelings in a very short manner. Poetry has been written in almost every language all over the world. Someone has rightly said that sad poetry is the expression of sorrows which human faces in his daily life. In very brief, Ghazal or Poem is a short story of your whole life, Poet describe the whole feelings of human life in very short pieces. This is called Ghazal or Poem. This is online platform which is offering a ton of poetry and Quotes that affects your heart directly. We are offering Sad Urdu Poetry, Urdu Ghazal Shayeri, Sad Image Poetry, Sad Image Shayeri, English Poems, Udaas Poetry and ton of more.